The Mini Super Twos visited Yarmouth Stadium on a warm and sunny Sunday 24th September for their third annual National Championship Final. There were two notable additions to the booking list with #33 Ollie Dance making his debut in the former Paul Cook car and #279 Stevie Wood in a brand new car following a successful hire outing at the previous meeting. For the second year in succession #515 Craig Driscoll started in pole and led from the start while fellow front row starter #16 Courtney Smith retired with a broken chain shortly after the race got underway. Driscoll led until lap two when #70 Rob Dance, who started from the second row, moved him aside to take the lead with both drivers exchanging bumper hits and first place for successive laps as they progressed through the backmarker traffic. #704 Graham Crouch made good progress after starting sixth and, approaching the mid-point of the race, was now up to third and closing on Driscoll and Dance as the lead pair continued their tussle. It was at this stage the decisive moment of the race would occur going into the pit bend with Dance pushing Driscoll wide as Crouch seized the opportunity to make a run on the #515 car and move into second position. This was just enough for Dance to put some space between himself and the chasing cars. As Driscoll moved to regain the second spot the #515 and bright yellow #704 cars made contact and tangled bumpers for a moment, allowing Dance to pull even further ahead and build a lead that would prove insurmountable. While Driscoll made chase Dance was ticking off the remaining laps and took the flag with a little over four car lengths between first and second. Crouch was unable to hold onto third as #81 Paul Cook made a late charge for the final place on the podium, continuing a series of strong results for the Ipswich man in the second half of the season. 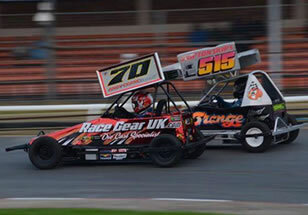 Crouch was fourth while #23 Tim Cotter took fifth and British Championship winner #317 Mark Sanders in sixth place. With the Final completed as the first Mini Super Twos race of the meeting the subsequent heats gave a glimpse of what is to come in the next 12 months with Driscoll and Dance taking a win apiece, racing hard from the back of the field. #279 Stevie Wood narrowly missed out on a maiden win in the second heat after a late spin saw him relinquish a good lead. Kart racer Jack Ferguson presented the trophies to the top three drivers.